The requirements for CCTV installations globally often vary from those of the UK CCTV market. 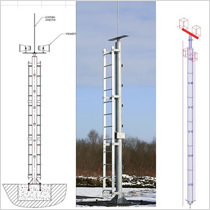 Although the same product types are used, due to the nature of the installations, particularly for the Petrochemical Industry, Altron provide a full range of support products for mounting equipment boxes, speakers, explosion proof housings as well as towers and poles up to 25m with ladders and platforms. We also provide products for telecoms and radar.